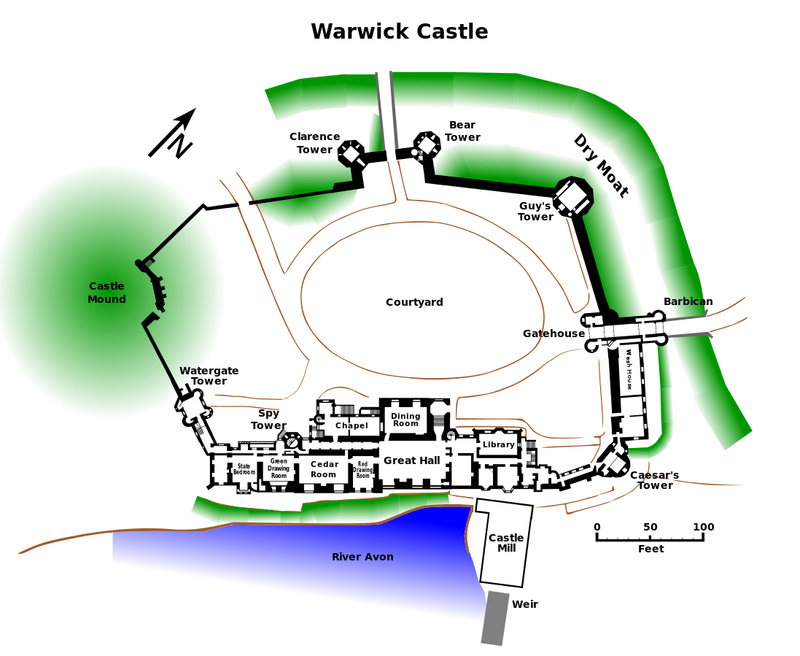 In Part 1 of this post, I wrote about the construction and design of the various buildings that have become the Warwick Castle we see today. In this post I’d like to show some of the fun activities laid on at the time of our visit in August 2015 and a few of the displays and waxworks inside parts of the castle. Next we headed to the rooms in the undercroft devoted to ‘The Kingmaker’, Richard Neville (1428-71). Neville was the 16th Earl of Warwick, who took command of the castle in 1449. He was a good administrator who did much to modernise and improve the castle, and in the second half of the 15th century he became the most powerful man in Britain. The exhibits describe his life and subsequent death at the Battle of Barnet. They also show his life at the castle, as well as the lives of others who lived there. Here’s a selection of the many photos we took – some of which were ruined by glary lights. Richard Neville inspiring his men. Gentlemen in the ‘Smoking Room’. Butler in attendance at the house party. Caesar’s Tower, at the north-east corner of the curtain wall. Caesar’s Tower, showing people waiting to enter the dungeon. Approaching the upper levels of Caesar’s Tower from the battlements. A scary reminder of what could happen to you once thrown in the dungeon! The rooms inside Caesar’s Tower are interesting to visit, although it was only permitted as part of a guided tour – and cost an extra £9.00 to get in. We were led round various rooms to watch a series of short dramatizations – some of which were a bit gory (all pretend!). One was in a torture chamber and another was a medical ‘operation’! Yet another was a medieval court scene whereby a judge pronounced ridiculously unjust punishments on prisoners who had supposedly committed some small crime – like stealing a cabbage. Needless to say, members of the audience were picked to play these unfortunate prisoners (my husband being one of them!). It was just a shame that photography wasn’t allowed. Eventually we headed underground to the dungeon. This was similar to most dungeons I’ve seen elsewhere, with very little light and graffiti on the walls from prisoners of centuries ago. And awful torture chambers. Apologies for the glary patch on this information board! This grille on the dungeon floor is the opening into what is called an oubliette – a very chilling thing indeed. Any unfortunate prisoner put into to this tiny space – not even big enough for him to stand up in – was effectively forgotten and left there to die. In the third post about Warwick Castle, I’ll eventually get round to writing about the event we actually went to Warwick to see: the joust. This is so fascinating, I would love to visit this castle! and of course, the Dungeon! Thanks Holly. I’m sure you’d love a visit to Warwick. It’s a great castle and a day spent there is lots of fun. There’s a cafe/restaurant, as well as plenty of picnic areas. On events day, there are food stalls, too. The dungeon is well worth seeing! Lots of fun to be had, and history to be learned! Absolutely – plenty of both of those. It does get crowded during the summer, though – but that can add to the fun. Wow, a castle! How exciting it must have been! I sang that some many times as a child and to my children. Neat to know a bit about who it was written for! I must go back and read part one! Thank you for taking us on the tour! Thanks, Koko. We all love castles, don’t we? There’s something romantic about them, and so many stories are set in them in the past. There are quite a few haunted ones around, too! 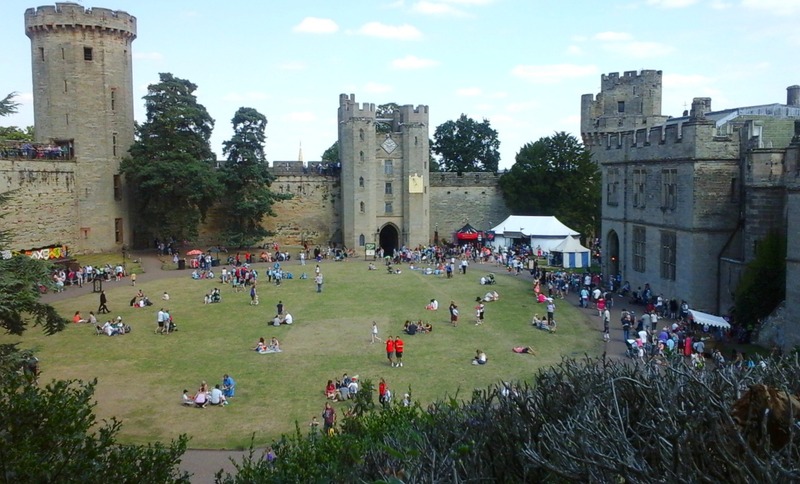 Warwick is one of the best castles for visiting with children, especially when the special events are on. The song ‘Daisy’ is so well known and is a fun little tune. I admit, until we visited Warwick Castle, I had no idea who wrote it or why. Glad you enjoyed the tour. Super fascinating. I do appreciate you sharing your adventures. Have a wonderful weekend! Thanks Koko. I an’t help blabbing about places I love to visit. Have a great weekend too. Looks like a lot of fun. The castles are wonderful! I adore castles, Cheryl. We have so many of them in Britain and I’ve visited dozens. Many are just ruins, but there are quite a few well maintained ones, like Warwick. For children, there are regular fun events and activities throughout the year. In lovely, sunny weather, it’s a perfect day out. It’s like a serial Millie and I am enjoying it..its hard to imagine how anyone could be treated so badly for crimes so minor and as for being forgotten, what did you have to do to warrant that treatment? Thanks so much for sharing all this with me.. The dungeons of those times were such awful places and inmates were shown no mercy. The oubliette is a horrifying thing. What an awful way to die. But history is full of examples of harsh punishments for minor deeds. For a starving peasant to have a hand hacked off for stealing an apple, loaf or cabbage, is hard to understand. Thank you for reading, Michael. But yes, sending people to the other side of the world seems unbelievable to us today. So much of our history makes us cringe. You can tell Nick my favourite Yorkshire cricketer was Fred Truman. I loved his commentary on the games, he told the most amazing stories with so much humour and I was lucky to read his life story one time. I think he did a lot to change the culture of English cricket for the better I might add. I have searched for copies of his radio interviews but they don’t seem to be available now. 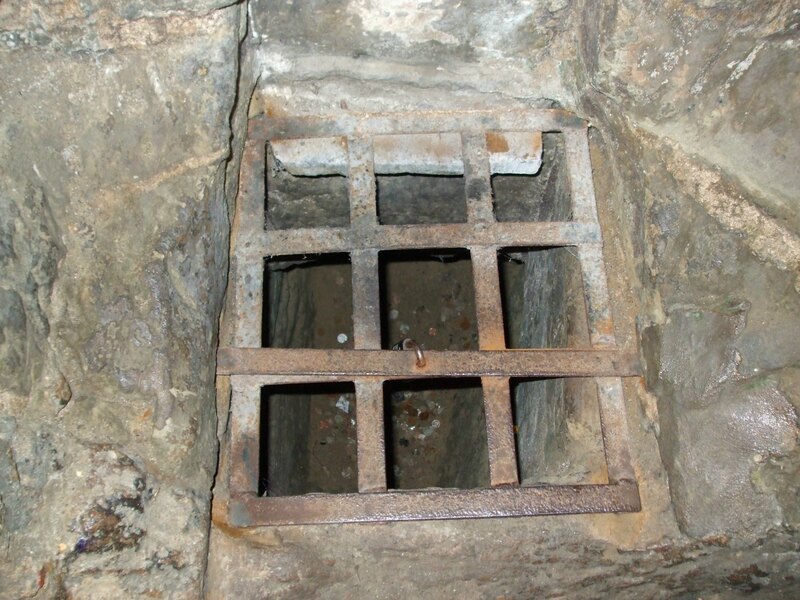 Fascinating post with fantastic photos, a lovely song for Daisy, and then the horror of the Dungeon, particularly the oubliette. Humans can be so cruel. I can’t stop singing ‘Daisy’ since I wrote that post. I’m driving Nick round the bend! Lol. 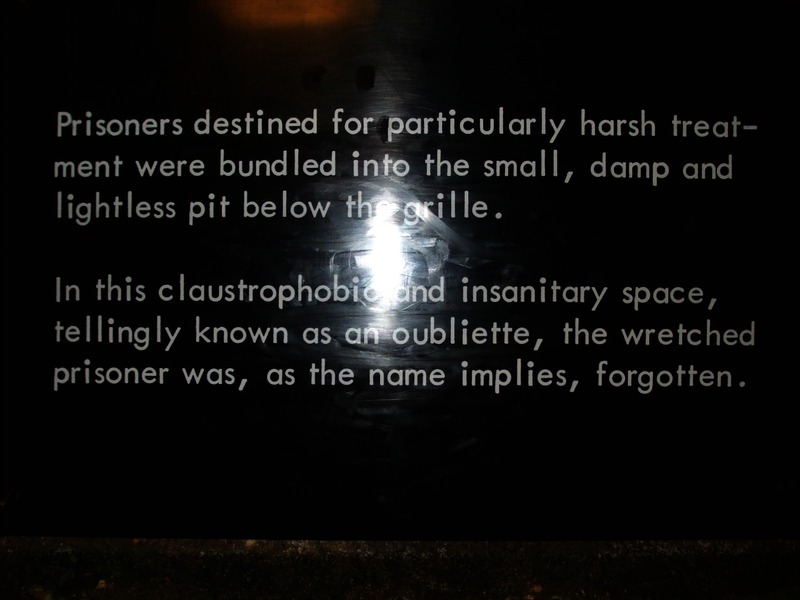 The oubliette is a horrifying thought, and illustrates well the saying about ‘man’s inhumanity to man’. Being locked down there until you died doesn’t bear thinking about. Keep on singing ‘Daisy’, better than thinking about the horrors of the oubliette. Beautiful and barbaric, just like the human spirit. My soon-to-be-ten boy (who learned a lot about the Medieval and Renaissance periods this yr) enjoyed the post. Thank you! Your description fits this period of history particularly well – although I doubt the human spirit has changed since then. The oubliette is especially barbaric and is, effectively, a very long, dawn-out form of execution. I’m glad my post was useful for your son. I loved teaching about the medieval period. So sad to think of those in that tiny space beneath the grill. Chilling to think of it. Thank you Kay. 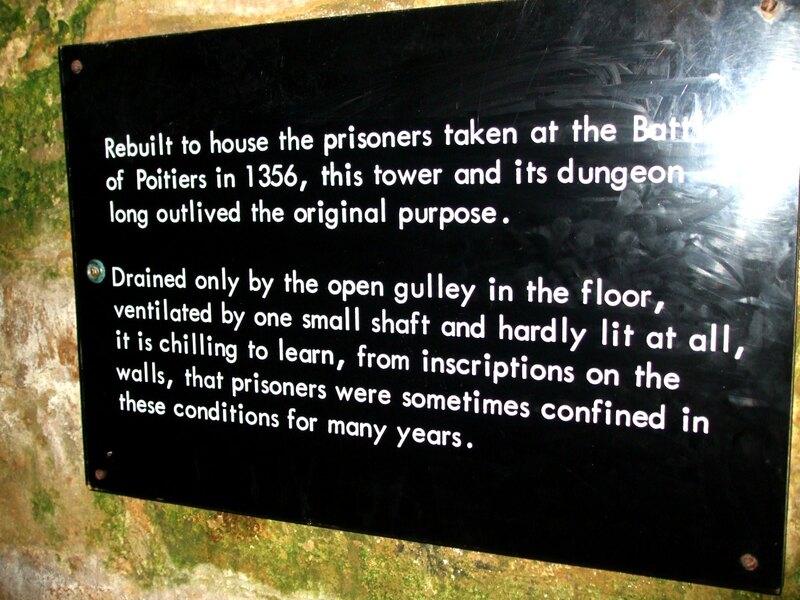 The oubliette is a very chilling place and one that would strike terror into the hearts of all prisoners in the dungeon. So many interesting things to see there! I admit, I would be happy to pay all the extra admittance fees to get in. It’s amazing to see those suits of armor and try to imagine what it would be like to move around in them, much less try to fight without falling over. Are the figures in the inside dioramas really wax works? My goodness, I thought they were real! I’ve been reading “A History of Costume” by Carl Kohler so of course I’m most fascinated with all the details of the outfits. 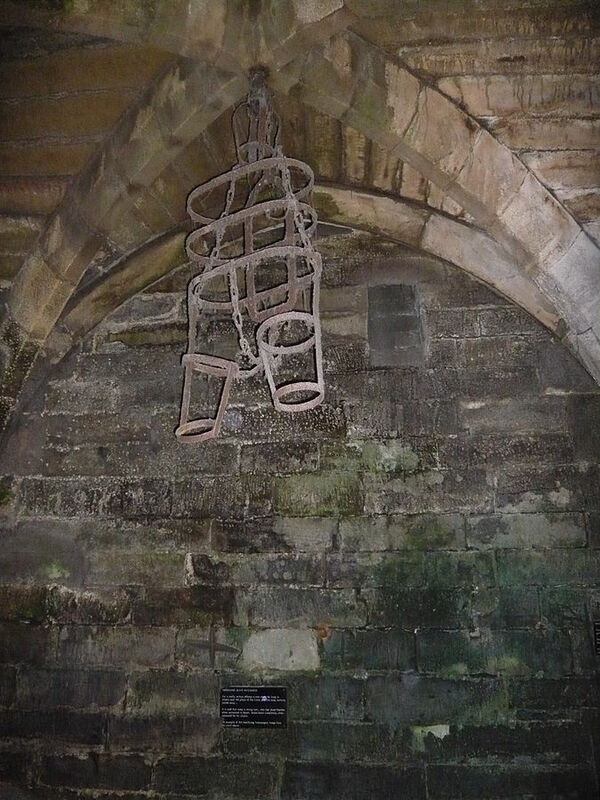 I’ve read that some of those terrible torture devices were actually made up later and weren’t used, but the oubliette was, and even without “Medieval torture devices” those dungeons must have been horrible beyond what we can even imagine these days. Thank goodness the justice system has advanced since then, at least for most parts of the world!